Natasha (Tasha) Gutierrez’s life took an unexpected turn when she was diagnosed with cardiomyopathy at 25 years old, which is rare at that age. Since then, she has been on a challenging journey to make her heart stronger and has received an internal defibrillator and a Left Ventricular Assist Device (LVAD) to keep her alive. One day she will need a life-saving heart transplant. Even with insurance, the costs of Natasha’s care are quite overwhelming, and she needs your help. Natasha is one of the most loving and spirited people you’ll ever meet. She loves taking family trips and enjoys spending time with her four dogs. Natasha misses attending school and desires to receive a degree in the medical field to help people just like herself. She loves putting a smile on other people’s faces. Natasha’s hope is to be able to have a full, long life with her husband, Octavio, and family. The expenses associated with Natasha’s care include co-pays, deductibles, and travel for testing, temporary housing expenses to live close to the hospital for several months post-transplant, travel expenses, and the costly immunosuppressant medications that she will need to take for the rest of her life. The costs are adding up and the Gutierrez family needs your support to help make Natasha’s hopes a reality. 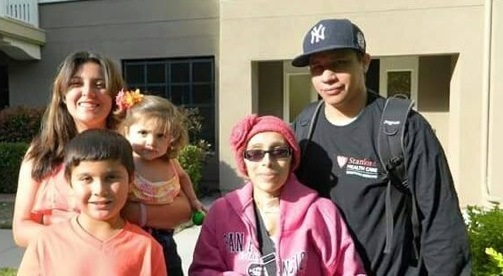 To help with the financial burden of Natasha’s uninsured expenses, a fundraising campaign in her honor has been established with HelpHOPELive, a trusted nonprofit organization that has been providing community-based fundraising guidance to patients and their families for more than 30 years. All donations are tax deductible, are held by HelpHOPELive in the Southwest Heart Transplant Fund, and are administered by HelpHOPELive for transplant-related expenses only. Please consider a contribution. If we all work together, we can make Natasha’s future much fuller and brighter. Thank you in advance for your support and generosity. Please know that your contribution is changing her life. Hello everyone! As of May 4 2016 I have started cardiac rehab. Everything is looking and going great. It’s going in the right direction and the doctors are very happy with my progress. Please continue prayers. Thank you all for your donations. God bless you. great news as of April 7 I will be discharged and be able to go to my temporary housing. Thank you all for you donations and prayers. Please share and spread the word. My wife is still in the ICU, but she is doing great. Her doctors are very happy with the progress she is making and they plan to send her to the recovery floor tomorrow. Tasha and I greatly appreciate all of your prayers, post and donation. Please keep sharing and posting away!!! Tasha is still in the ICU recovering. She is progressing day by day and everything is going in the right direction. We greatly appreciate all the prayers and support from everyone. Thank you so much for your generosity by donation. God bless you and have a great day!! Your sister Erica's friendship has been such a blessing to our family, and because of that we know what an amazing woman you must be as well! We're so happy that God has made it possible for you to get a second chance at life with your new heart. You and your family are in our prayers!